At DSE 2016, that opened today, the video wall is back in a big way. And this is not your father’s video wall. Gone are the days of the large unsightly bezel, and energy-guzzling video walls that need lots of expensive video processing. The small and now ultra-thin bezel video wall is here, now– making possible the near-seamless large screen display that’s ideal for many public spaces including airports, train stations, retail stores, corporate lobbies, donor boards, and much more. And with interactive features now readily available, you can either upgrade your video wall to interactivity and/or future-proof your digital signage rollout to add interactivity later. New generation LCD panels, improved and much less expensive video processing and content management software, improved durability of LCD panels (including outdoor-rated panels) and better energy efficiency now put myriad video wall hardware and software options in the reach of almost all digital signage installations. And beyond LCD, there are now direct-view LED displays that are configured for video walls and that are getting more high resolution each year. At DSE look for video walls displays as well as image processing and mounting solutions, from a long list of exhibitors including Planar, Leyard, LG, NEC, Premier Mounts, Peerless-AV, Samsung, Christie, Sharp, Daktronics, Barco, Toshiba, Panasonic, BSI, MultiTaction, Philips, BrigthSign, Chief, LED3, Lightware, AOTO, NanoLumens, LG-MRI, Viewsonic, Vivitek, SiliconCore, rp Visual Solutions, Shenzhen, and more. 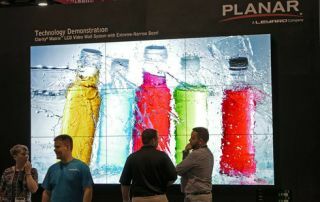 Planar is demo’ing video walls with 1.4mm bezels at DSE. LCD video walls are by no means through evolving and offering innovative new features. And for LCD video walls, let’s start with thin bezel video wall displays. In recent years technology improvements and engineering breakthroughs have allowed thinner mullions, or “bezels” in video walls. (The term bezel refers of course to the black line, or thin border between each screen that makes up a Video Wall.) The best video wall/flat panel display manufacturers are offering bezel sizes in the “Narrow” range: about 3.5mm bezel width. But only the A-tier display and Video Wall manufacturers are making “super narrow bezel” products available with a bezel size of as little as 1.8mm– available today (LG was the first to come out with 1.8mm bezel, and the first to ship product). But at the DSE show that kicked off today, several LCD video wall manufacturers (including Planar) are demo’ing video walls with even smaller bezels, as small as 1.4mm (though apparently none of those 1.4mm products are shipping today). With LCD panels and video walls made up of LCD panels, the trend of 4K is as strong as it is with stand-alone, single screen digital signage. And while the very nature of video walls means that you can create 4K with tiled 1080P screens, there are and will be more applications with tiled native UHD or 4K screens– to get to 8K, or 16K or more. LG’s Dual-View Curved Tiling OLED Display is making a huge splash at DSE this week. It offers a curved design using slim tiles to form customizable displays that link two, three or four tiles together. For the 65-inch portrait display on display in the LG booth, each screen boasts 4K Ultra HD (3840 x 2160) resolution, and with HDR processing for incredible contrast ratio and deep deep blacks. If all the developments in LCD technology were not enough, we now have the emergence of an entirely new category of display for video walls: direct-view LED. And this year there is an explosion of high res direct view LED. Samsung now has 1.1mm LED. SiliconCore has 1.9mm. Planar’s 1.6mm is very impressive (and in the Planar booth there is also 1.2mm pitch direct view LED from its parent company Leyard), and AOTOs 1.2mm technology is out there. Also look to LG, Daktronics, Barco, and Leyard, for new developments in super high res direct-view LED. With fine pixel pitch LED displays you can get to HD resolutions in just 110” diagonal display size or less. Silicon Core is showing .95mm pixel pitch direct view LED at the DSE show, achieving full 4K resolution at just 165” diagonal. A video wall from Digital Signage Expo exhibitor BSI. That’s just a tiny sampling of the video wall solutions on view at DSE this week. And certainly one of the most intriguing “video wall” demos at DSE: the stunning OLED from LG. LG’s Dual-View Curved Tiling OLED Display offers a curved design using slim tiles to form customizable displays that link two, three or four tiles together. The 65-inch portrait display on display in the LG booth, boasts a paper-thin and dual-sided view to offer customers a multi-media experience “while providing retailers a way to utilize their space efficiently” according to LG. Each screen boasts 4K Ultra HD (3840 x 2160) resolution, and with HDR processing for incredible contrast ratio and deep deep blacks.